Apple pie filling: How to Make Homemade Apple Pie Filling to Can or Freeze at Home, Easily and Illustrated! Looking for Apple pie filling: How to Make Homemade Apple Pie Filling to Can or Freeze at Home, Easily and Illustrated! in 2019? Scroll down this page and follow the links. And if you bring home some fruit or vegetables and want to can, freeze, make jam, salsa or pickles, see this page for simple, reliable, illustrated canning, freezing or preserving directions. There are plenty of other related resources, click on the resources dropdown above. AH, apple pie filling... 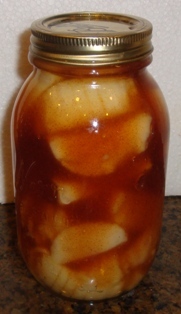 If you have a surplus of apples, and after making applesauce and apple butter, you want to put up more for the months ahead, then you might want to make your own home canned apple pie filling Did you think making and canning your own apple pie filling or jam is difficult or expensive? Not at all! Here's how to do it, complete instructions in easy steps and completely illustrated. 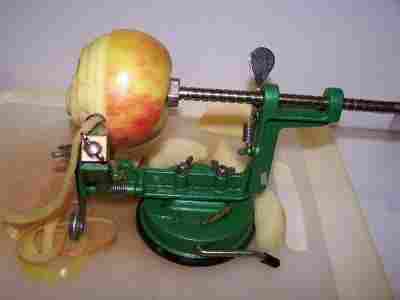 The apple pie filling will taste so MUCH better than that over-sugared tasteless glop in the can from the grocery store, and by selecting the right apples, it will be so naturally-sweet that you won't need to add much sugar. Prepared this way, the jars have a shelf life of 18 months to 2 years, and require no special attention. You can also freeze it! so I use it just to be safe. Instead, choose apples that are naturally sweet and tart varieties, like: Bramley, Cox Pippin, Fuji, McIntosh, Stayman Winesap, Jonagold, Rome, Cameo, Jonathon. If you can't get any of these, then try Red Delicious, Honeycrisp, etc. 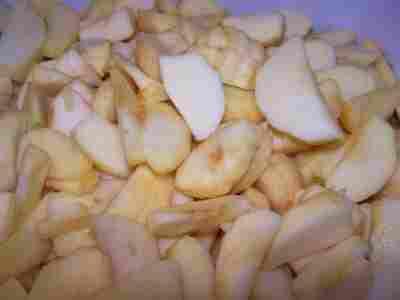 You want a flavorful, aromatic and firm apple (Golden Delicious and Galas are too soft, for example). Always use a mixture - never just one type. The Fuji's and Gala's give it an aromatic flavor! 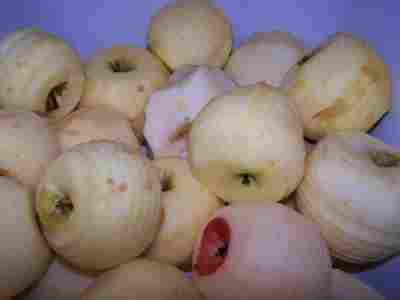 Honeycrisp and Pink Lady are also excellent, sweet, flavorful apples. It's pretty simple: place sliced apples at a time in a large pot with at least 1 gallon of boiling water - the larger the pot and the greater the volume of water, the better! Boil each batch 1 minute after the water returns to a boil. 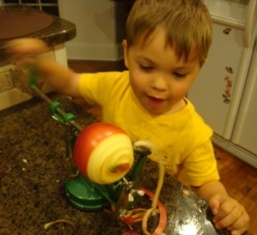 You're not really "cooking" the apples - just blanching them. Blanching means heating at high temperature for a brief time to stop the enzymes that can cause the flavor to degrade during storage. You could use water instead of apple juice. But best results will come from staying fairly close to the recipe. I've had excellent results using half the amount of sugar and adding other spices (typically some nutmeg and cloves, in addition to the cinnamon). Mix the ClearJel or corn starch with the lemon juice and add this to the juice in the pot. Boil 1 minute on medium heat, stirring constantly, just until it starts to bubble and thicken. Then remove from the heat. It ought to be reasonably thick, but still able to flow. 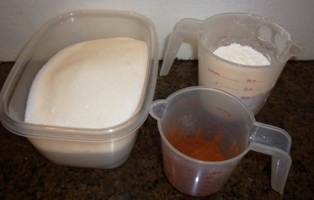 Note: According to the USDA's National Home Food Preservation Center at the University of Georgia, ClearJel® is a corn starch that has been modified to give it special and unique characteristics when used in food products. It is recommended by the USDA for making pie fillings because it does not break down in the acid food mixtures and does not thicken enough during heat processing to interfere with the intended effect of the heat on killing bacteria during canning. In other words it reduces spoilage and is safer than corn starch. It is preferred for thickening canned pie fillings as well as other foods over other corn starches because it has less or no aftertaste, the thickened juices are smooth and clear, and foods thickened with ClearJel® may be frozen. If you want to freeze the filling instead of can it, just fill your freezer containers (typically ZipLoc bags or plastic containers) or an uncooked apple pie crust, exclude air and seal! then pop it into a deep freeze and ignore the remaining steps below. 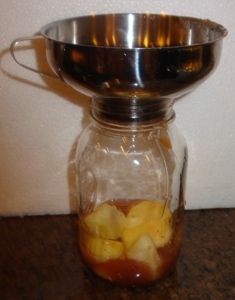 Step 10 - Fill the jars with the apple slices and liquid. 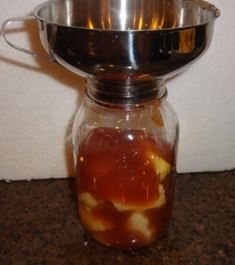 As the liquid is now very thick, it won't easily flow, so you need to fill the jars by alternating layers of liquid, then apple slices then liquid, until the jar is full to 1 inch below the top. After each layer I use a spoon, blunt knife or my fingers to press down to fill any air spaces with liquid. A jar funnel helps. Gently jostle the jar and lightly press the slices to help them settle in the jar and reduce the amount of air space. Pack the jars tightly with apples. If you don't, the apples will float and the bottom of the jar will be nothing but syrup. 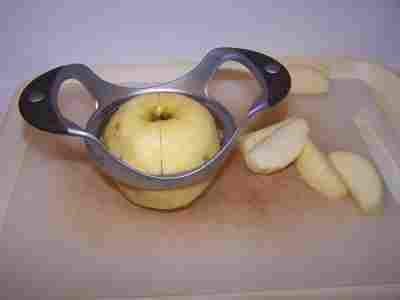 Fill them to 1 inch of the top, (1 inch of headspace) and jostle and press the slices down to fill any obvious air spaces, wipe any spilled apple pie filling of the top, seat the lid and tighten the ring around them. You'll need 1 inch of headspace if the filling has cooled down (it will expand), and more like 1/2 inch if it's kept very hot and there are airspaces you couldn't eliminate. 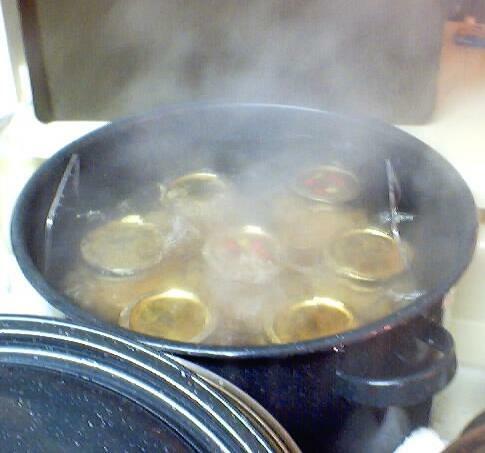 Put them in the canner and keep them cover with at least 1 inch of water and boiling. if you are at sea level (up to 1,000 ft) boil pint and/or quart jars for 25 minutes. 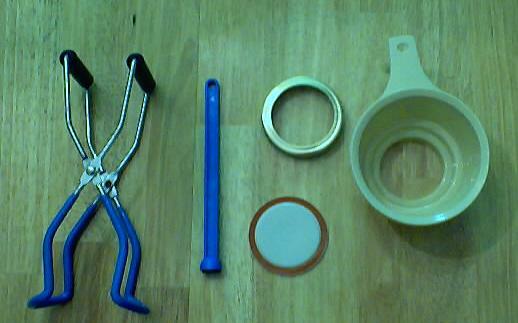 USDA-Recommended process time for Hot Pack Pint or Quart Jars of Apple Pie Filling in a boiling-water canner. So later, how do you use the canned pie filling to make a pie? Easy! Make your crust (see this page), preheat the oven to 425 F. Pour the pie filling into pie crust. Use as little of the liquid as you need, and fill the pie with mostly apples! By minimizing the liquid, that will result in a firmer more appley pie! Sprinkle with a crumb topping (see this page for the crumb topping) or dough (which ever or none, as you prefer). then cook the pie at 425 F for 10 minutes, then turn the heat down and cook at 375 F for another 45 minutes to 1 hour. 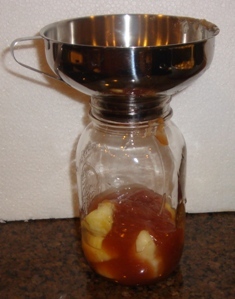 This document was adapted from the "Complete Guide to Home Canning," Agriculture Information Bulletin No. 539, USDA, revised 1994, Reviewed June 2006, Revised November 2008. 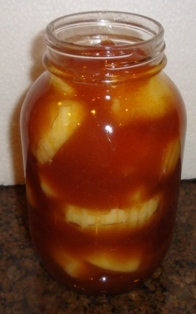 Q. I've canned apple pie filling in the past and your recipe looked interesting as it did not contain cornstarch and I liked the idea of making the sauce out of apple juice instead of water. Your recipe called for using 2 tablespoons of Clear Jel Starch, which I didn't have on hand so I used 2 tablespoons of Arrowroot instead. 2 tablespoons of thickening agent didn't seem like enough, but I had never worked with Clear Jel so I wasn't sure. In any case, the "sauce" part of my pie filling is too thin. Is Arrowroot not an appropriate substitute or should I have used more? And now I am in a dilemma as well now that the canning is finished (I thought it would perhaps thicken as it cooled). When I use the filling, I can strain the apples and thicken the sauce... how would you suggest I do that? My other question is if it is possible to thicken the sauce of all the jars and re-can them, or would that pose safety concerns? I love to give the filling away as gifts around Thanksgiving, but I could always bake the pies and give those away instead! In any case, if you could assist me with these questions I would be most appreciative!!!! And THANKS for your website... it is a great resource and is now saved as a favorite!! Arrowroot has different properties; I'm not sure what the exchange rate would be or how well it holds up. The unique aspect of Clear-Jel is that the USDA has tested it in home canning recipes for both quality and safety, so we know it works and is safe. Of course, with a filling that is too thin, you can always add any starch (corn starch, for example) when the filling is opened to make a pie. You could even just attached a ziplock bag with a little (say 7 tablespoons per quart jar) of starch to each jar for the gifts. I wouldn't go back and remake the jars that are already sealed. If you open each jar, add starch, heat it up and reprocess the jars with new lids, it would be safe, but that's a lot of work. Arrowroot: Comments from a visitor on October 09, 2010: "It is important to note that Arrowroot is used as an stabilizer, so will not have the same properties as cornstarch or Clearjel. It is used to stabilize egg whites, to double the volume of egg whites in making meringue." Q. 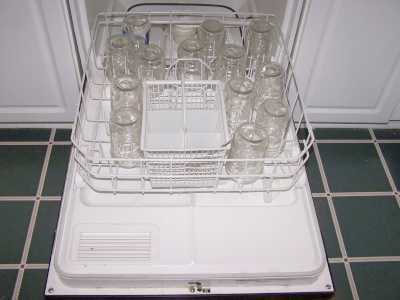 Lemon Juice: A visitor writes on October 08, 2013: "Hi, Can you tell me if when making your apple pie filling and other pie filing recipes for canning if I can leave out the lemon juice? Can you explain why the recipe calls for it to be added? Thanks so much." The USDA's National Center for Home Food Preservation says: "If apples lack tartness, use an additional 1/4 cup of lemon juice for each 6 quarts of slices." So, that indicates to me that it is not absolutely necessary, just if the apples aren't acidic on their own. I would think , with most apples, you could skip it. But, as their note is specific to apples only, I would not skip it for other types of fruit pie fillings. They do not explain why the lemon juice is added, but certainly it increases safety, and probably helps the thickening. 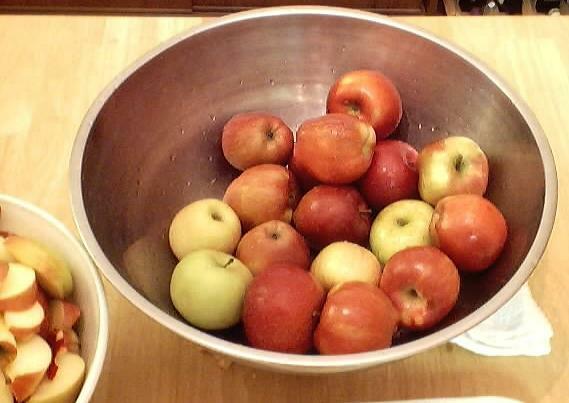 Comments from a visitor on August 07, 2012: "Last year we made your apple pie filling and our family just LOVED it. Thank you for making this site for all of us just getting into canning. This has been a real help to me. 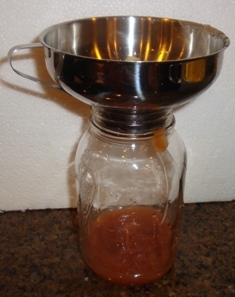 I plan on using it again this year and expanding my canning experience too. THANK YOU!!! "